Tom Phelan plays trans teen Cole on ABC Family's The Fosters. Phelan sat down with SheWired to discuss the show, working with Rosie O'Donnell and Maia Mitchell, and trans representation in the media. You should probably know teen actor Tom Phelan, who just debuted a breakout role in ABC Family's lesbian mom-headed drama The Fosters. 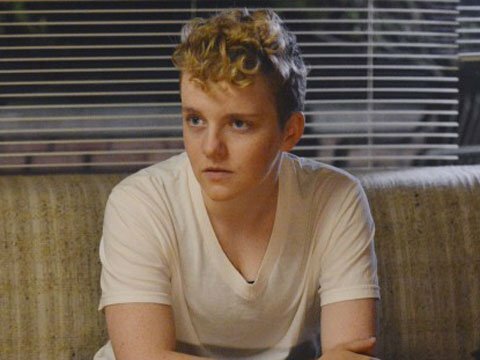 In a move that is frustratingly uncommon for modern TV, Phelan, who identifies as nonbinary, plays Cole, a transgender boy who has found himself placed in the group home for girls. The role poignantly highlights some of the challenges and frustrations trans people deal with, especially when they encounter institutions like the foster care system or prison-industrial complex. Unlike the character Cole, Phelan identifies as non-binary — neither a boy nor a girl — and uses the singular pronouns "they/them/their" when discussing themself. Cole, on the other hand, identifies as a transgender young man and uses the standard masculine pronouns "he/him/his." Although their stories are often erased, non-binary trans people are just as real — and just as legitimate — as their binary counterparts. SheWired: In broad terms, of course it’s significant that a trans actor was hired to play a trans role — not that it should be, but it’s groundbreaking for Hollywood. Why do you think The Fosters and ABC Family want to get it right when so many other entertainment outlets don’t seem to bother? Tom Phelan: Honestly, I think it's just because The Fosters is such a diverse and well-rounded and well-represented show. I also think that with all the issues they're addressing, I think trans people come up as a logical demographic to address. With the growing popularity of Laverne Cox and Orange Is The New Black, I think we have a growing visibility in media. Everyone at The Fosters is really great, and I think they just wanted to provide some representation. Rosie O'Donnell has been wonderful as Rita, the head of the group home. What was it like working with her? It was totally awesome. I was so nervous my first day. It was my first time doing anything, so I had no idea where I was or where I should go. The first thing we shot was the opening scene, with Callie first being introduced to the home. It was really, really nerve-wracking because Rosie is just such an icon and a presence. She was totally down-to-earth and very sweet, and she made a point to strike up a conversation with anyone who was new or nervous. It was wonderful to watch her work, because she's known for her comedy, but her dramatic acting is just as great. From an accuracy point of view, specific to trans issues, was there anything the script didn't get right? It was pretty spot-on. I mean, there are a few things about Cole that don't represent the whole of the trans community, that have been misread. For example, Ciara Kiara says in one episode that Cole was "born in the wrong body." Obviously that doesn't apply to all trans people, but it does apply to this specific character. Cole is misgendered a lot throughout the show. He's in this girl's home where he doesn't belong, and that comes along with a lot of "she" pronouns. Honestly, I don't think there was anything in the script [that was inaccurate], nothing where I was like, "no, I won't do that." From a personal and professional stance, what was it like working with Maia Mitchell? She's totally awesome. She's really, really cool. She's someone you just want to hang out with all the time because she's so much fun, but also someone who's really wonderful to work with because she's such a pro and she's so good. Every time you're in a scene with her, it just feels very natural, and just a regular conversation. Then you watch it and find that you've done some of the greatest work of your life simply because you're working with someone who's so good and such a professional. Do you see this role as a sign of things do come? Are you hoping this leads to future roles? Oh, gosh, I hope I get more jobs after this. I'm still in high school, so I'm planning on going to college, but who knows? If I get offered something, that would be such a dream. I've always wanted to act, and I definitely want to pursue this as a career, but I can only hope! As the media often misrepresents and misinterprets portrayals of trans individuals, this role — and the fact that the show opted to cast a trans individual to fill it — carries with it a chance to educate a public that might not have their facts quite straight. What do you hope viewers will learn about trans people from your portrayal as Cole? Just that trans people are real, we exist, and we're not going away. It's really important for [cisgender, or nontrans] people to educate themselves. I really hope they take that away. Learn the terms, learn the pronouns, and get used to it because we're staying here. Will we be seeing more of Cole in future episodes? We do come back. You'll definitely be seeing more of Cole. We're not going away. Finally, do you have any upcoming projects you'd like to talk about, or anything you'd like to mention? I'm doing school plays, but not really, no. I'm on Tumblr and Twitter, et cetera.